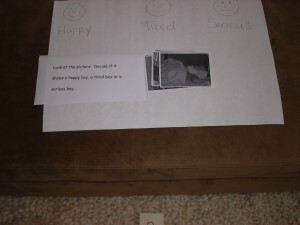 This is an early My Obstacle Course station activity that I did with Andrew (he was four at the time). I wanted to help him recognize and understand facial expressions in other people and thought that it would be a good idea to start with pictures of himself. 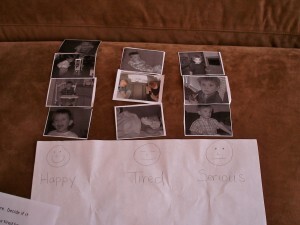 My Obstacle Course Station Activity: Match the photograph with the expression/feeling state. I looked through pictures and found some that were very obvious in what they were showing – happy (pictures of him while he was laughing or smiling), tired (pictures of him while he was sleeping) and serious (pictures of him studying something or just looking intently at something). Some other categories could be sad, silly, frustrated, embarrassed, angry, etc. I printed out the pictures and cut them into cards. I took a sheet of white printer paper, drew some basic faces to go along with the feeling word (I am most definitely not an artist!) and the station was set. Station activity is set and ready to go. When he got to this station, he had the best look on his face because he was surprised and excited to see pictures of himself with these different expressions. He didn’t need to be able to speak or read because he could use the pictures and the faces I drew to match up with the expression. Such a fun station activity to help build this important skill. He loved looking at all of the pictures of himself and I was able to point out specific aspects of each picture that supported the feeling state it was showing. This activity is a perfect example of not needing anything fancy to create a station that is meaningful while also providing information about where a child is with a certain skill or ability. P.S. My apologies for the poor photo quality! These were taken years ago, long before I had any idea that I would be posting them on a website/blog.